The first problem with the Wolfram Alpha iPhone app was that it cost $50. The second problem was that the site's iPhone web interface was nearly as good as the app, and it was free. Guess which issue Wolfram "fixed!" TUAW noticed a not-so-subtle change to the Wolfram Alpha's mobile site, which now prompts stingy iPhone jerks to just download the app already. Luckily you can kill the prompt, but then you're left with an unoptimized version of the search engine, which is a chore to use on a mobile device. 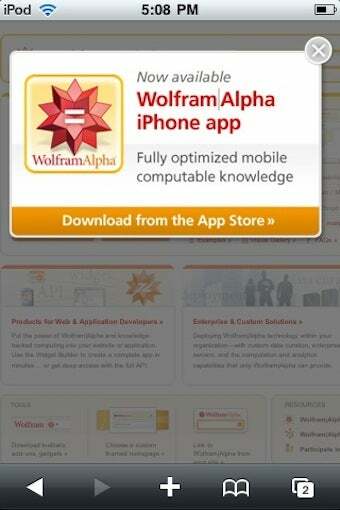 So, Wolfram isn't moving as many copies of their app as they expected (Dozens! You'll see!) and it's totally within their rights to, you know, make money. But instead of taking away the free, slightly-less-capable alternative, why not just make the paid, slightly-more-capable app remotely affordable? What's the problem with that?